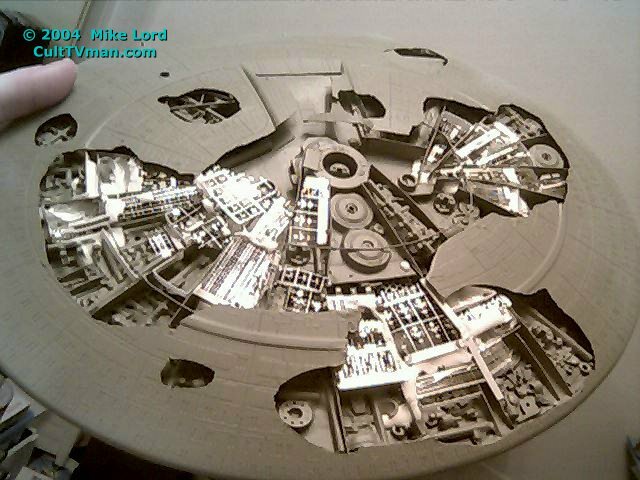 I’ve included pictures of my Enterprise-A project. One shows the building/painting status. Since it is almost impossible to re create the shining effect of the hull plating the proper way on a small scale like that, I decided to go with some kind of a snap shot. 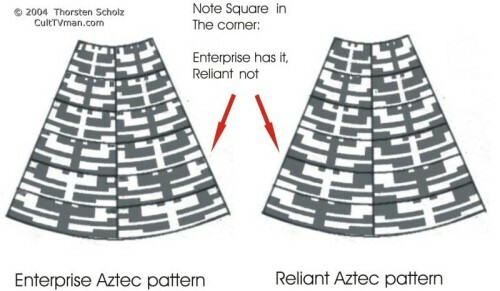 The hull might show these kind of colors on the Aztec pattern if viewed under an angle. 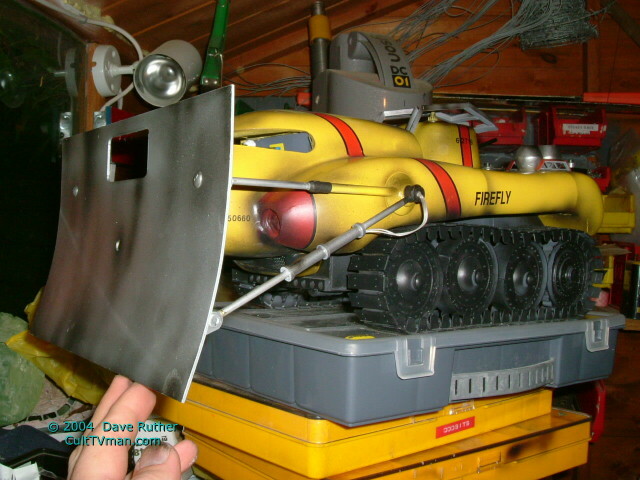 (With low light it almost looks like the real model, see second picture) All the painting is based on the pictures of the studio model taken by Mark Dickson. I think I’m pretty close to what you can see on those pictures. The other picture is a lighting test taken with low level environment light, but with out the spot-, Nav- and positioning lights. 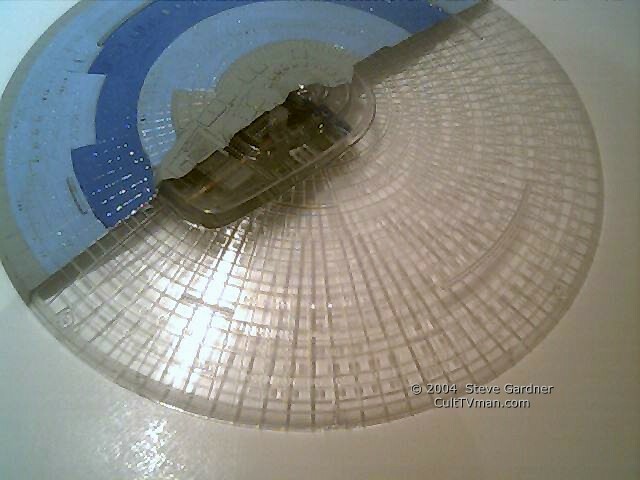 I’m somewhat proud of how the deflector dish turned out to look. no replacement parts have been used on the model! The RC Thrusters are no where lighted, since they do not shine all the time if you look at the movies and I like it better that way. Decals are not set, those are the decals that come with the model, I placed them for contrast when I started to figure out the color for the Aztec pattern. 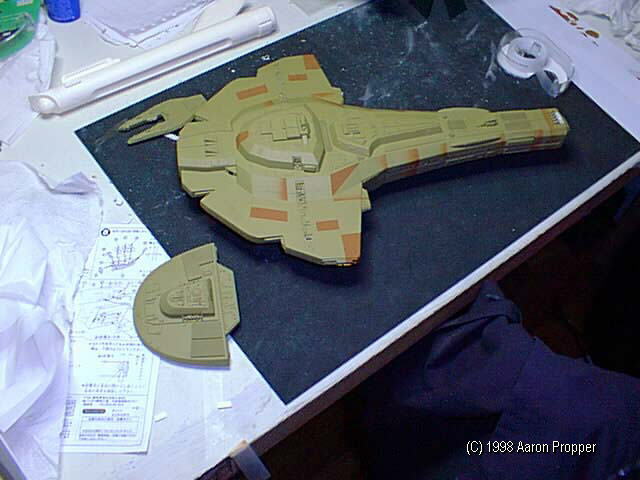 I will replace them with decals ordered at Federation models. 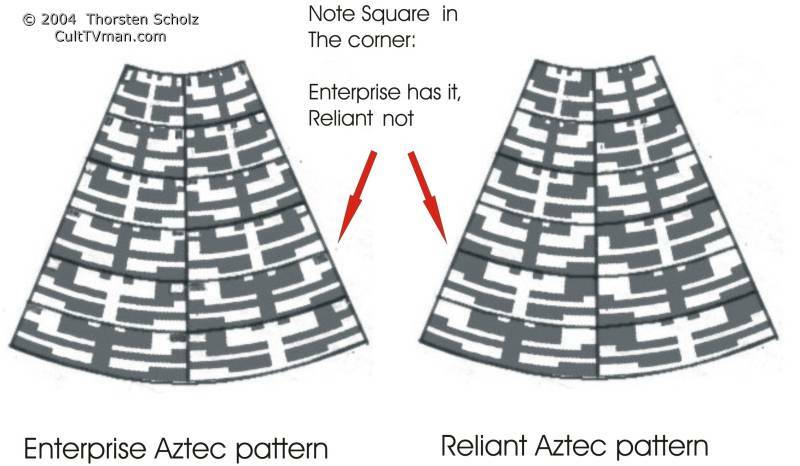 By the way, I noticed that most people used the Reliant Aztec pattern on the Enterprise. 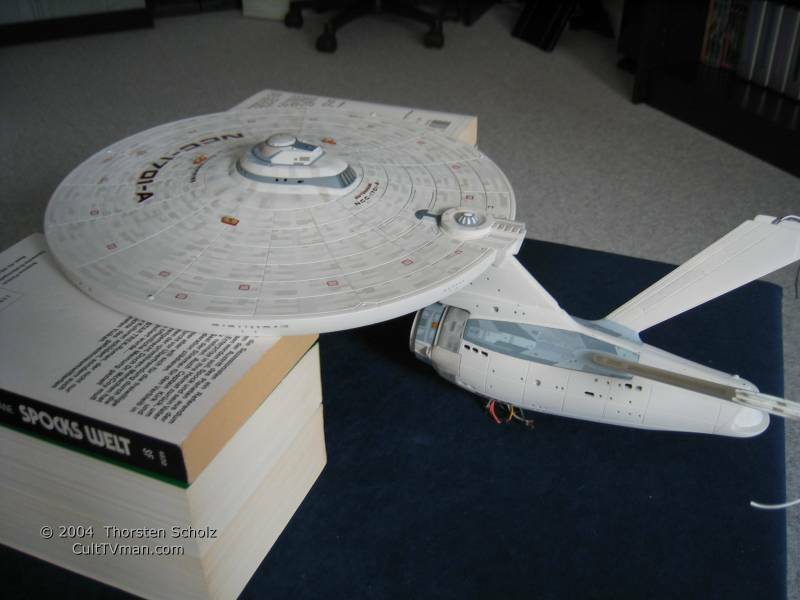 The Enterprise and Reliant pattern are almost the same, but not exactly! The difference is in the upper left and right side of the Individual sections. Enterprise has a square in the upper corners, Reliant does not! 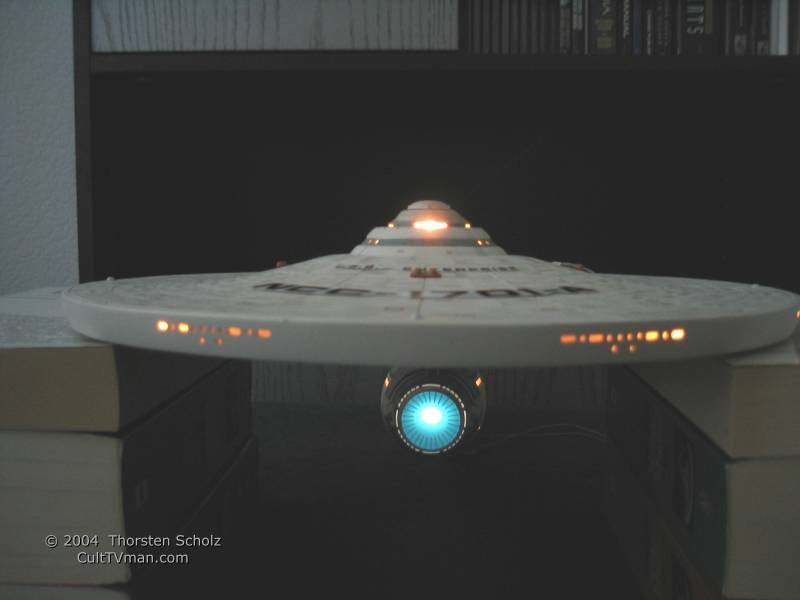 You can see it quite good on the pictures by Mark Dickson, and now also on the Picture of my version of the Enterprise.